Editor note: Today’s blog post is brought to you by Lana Naumova at Rock Your Data, a fast-growing consulting and technology innovation firm focus on cloud analytics solutions. 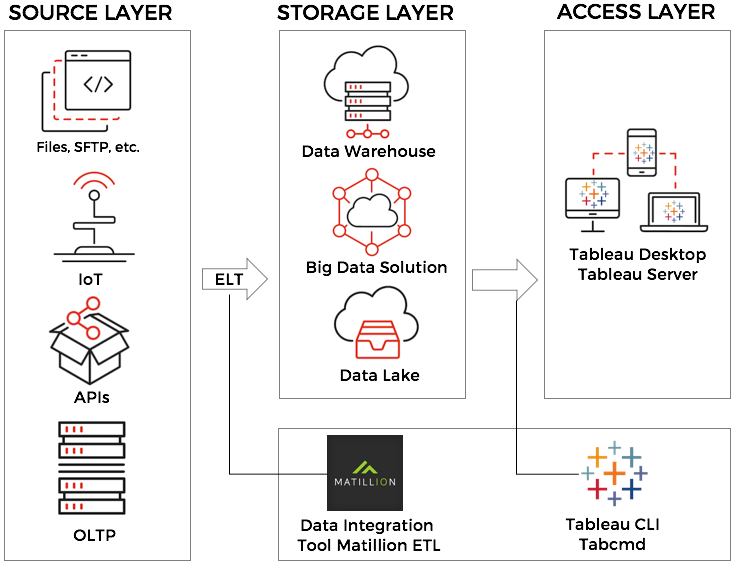 ‘Best Practices for Matillion ETL and Tableau‘ was originally published November 23, 2018 by Rock Your Data. Nowadays, analytics is a strong asset of any organization. It drives business insights and adds value to the business. As a result, organizations should deploy analytics solutions for collecting, transforming and storing data. They are choosing powerful and reliable tools in order to deliver actionable insights right in time. Source Layer – this layer is representing your business through data. Storage Layer – this layer is representing Data Warehouse and complementary technologies such as Hadoop or Data Lake. 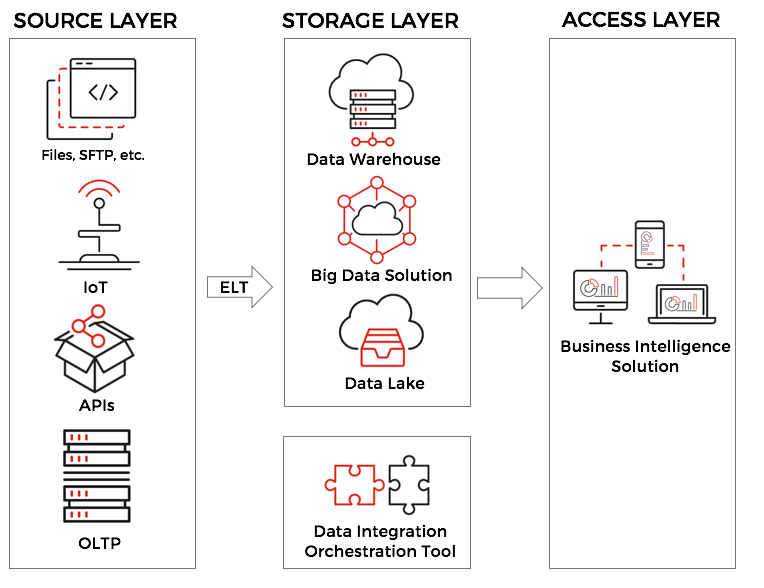 Access Layer – this layer is representing your end users, mostly business users who consume insights from the data and make business decisions. At the bottom, we have a key element that helps wheels rolling. You might think about this as a heart of your Analytics Solution. As a result, you should choose it very carefully. There are lots of tools available on market and they all will tell you the same story that they are the best. Unfortunately, this isn’t true. We tried a number of various ETL/ELT cloud and on-premise tools and found that Matillion ETL is a true leader and allows you to get fast value and keep strong SLA for the Data Warehouse solution. 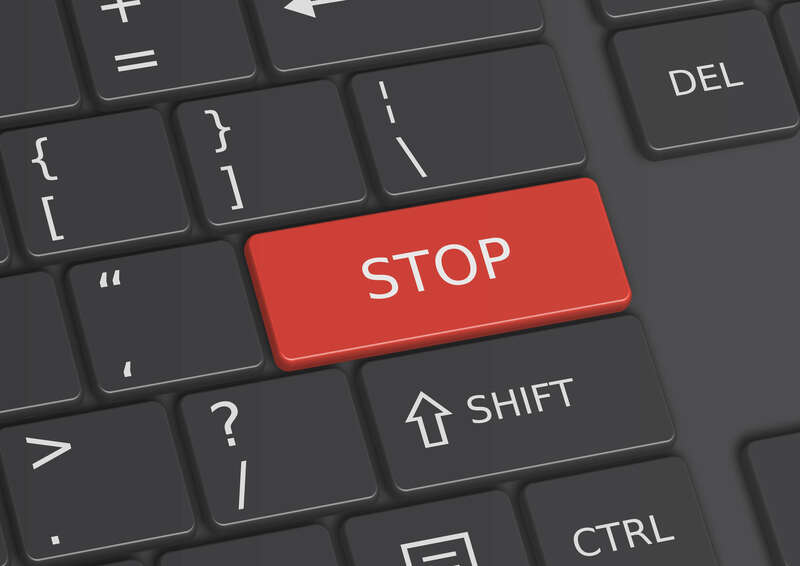 In this article, we want to go through one of the most common problems that we spot at every project. Usually, organizations tend to use multiple independent vendors for their BI solution. As a result, there could be a gap, especially between a Data Warehouse and Business Intelligence tool. Let’s understand this situation better through the example below. In one of our projects, a customer had their cloud data warehouse and use Matillion to load it. The customer was using Tableau as a primary BI tool. There are two individual processes here. The green one is Matillion, that is scheduled via Matillion Scheduler. The orange one is Tableau and it is scheduled via Tableau Server. 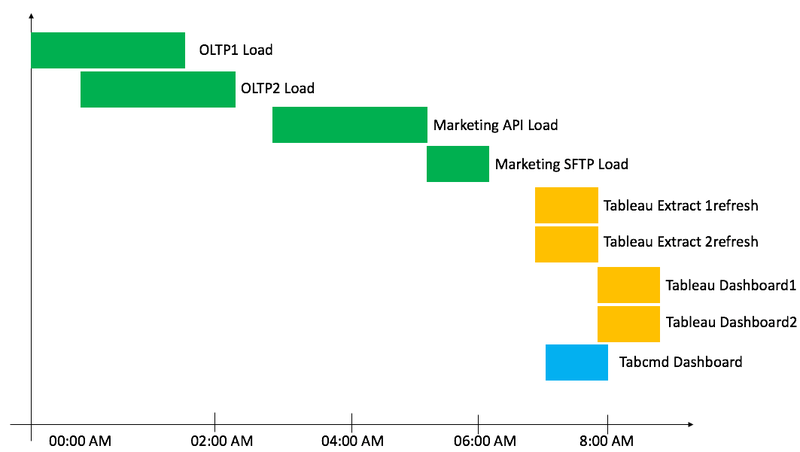 Usually, we ASSUME that ETL is done at 6 am and we scheduled Tableau Extracts and Dashboards a bit later. In our example, it is 7 am. 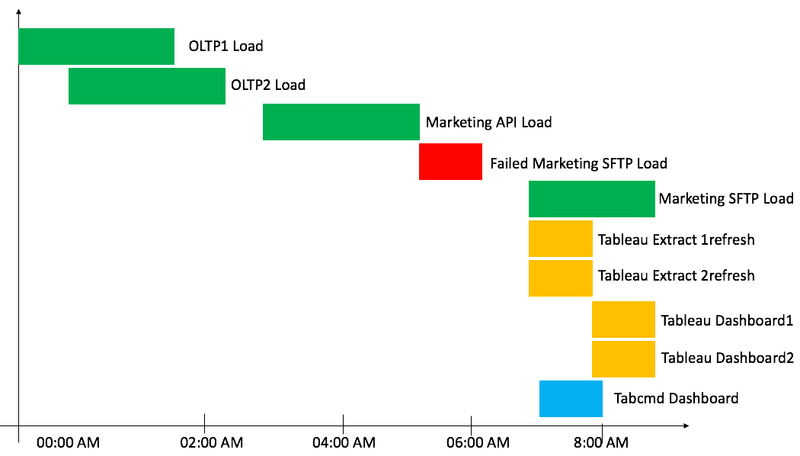 In addition, we are using Tabcmd and schedule Tableau Reports via Windows Task Scheduler. In our scenario, the ELT process was finished around 9 am. This should be the time of triggering BI reports and refreshes exports. As a result, business users got their dashboards with inconsistent data and they usually send all ELT/DW emails into a spam folder. Based on our experience, around noon, users will be realized that they spent half of the workday for nothing by working with inconsistent data. 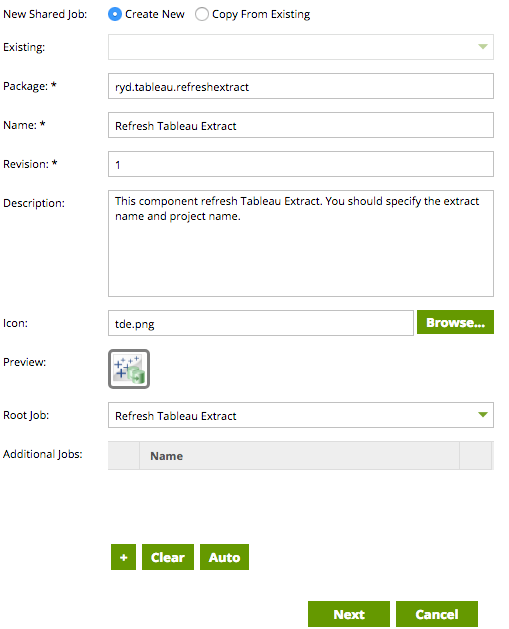 Tableau has a powerful tool TABCMD. It is command line utility which can use to automate administration task and allows us to control Tableau Server. In 2017 Tableau released Tableau Server for Linux as well as Tabcmd for Linux. Previously, there was a workaround, that allows us to use Tabcmd.jre from Windows for Linux use cases. Moreover, Matillion released Shared Job component that allows us to create custom components and make them nice for end users. 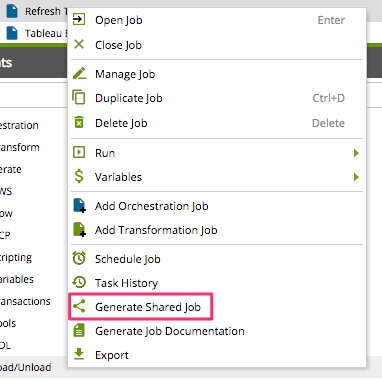 In this post, we will learn how to deploy Tabcmd for Matillion ETL as well as how to create a new Matillion component using shared jobs. We are using Matillion on AWS. You can create the same solution using Matillion on Microsoft Azure. We might trigger these components using AWS SQS or insert directly into the Matillion Job. 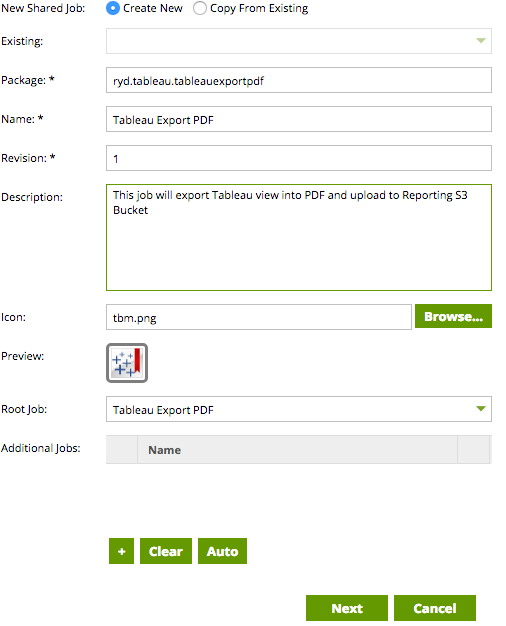 The result of Tableau export could be written into Amazon S3 bucket or you might mount shared folder. As a result, we install Tabcmd for our Linux. Now, we want to make sure, that everything works as expected. Note: It is important that Tableau and Matillion can see each other from a Network point of view. We recommend deploying your Data Analytics solution using the same AWS account and the same region. In case, if you have to use other topology, you might need to configure access. In order to test we can do the following commands – login to Tableau Server and trigger extract. Also, you might execute any other Tabcmd command. You can find a list of commands at Tableau Official Documentation. –synchronous – this parameter will wait for feedback from Tableau server about the end of the Tableau Extract refresh. This allows us to execute jobs in the chain. As a result, we can trigger Tableau from Matillion EC2. We even can copy this logic into the Matillion Bash component, but it will hard for business users to go through it and self-serve. In order to simplify the job of end users, we will leverage Matillion Shared Jobs and Matillion Variables. Before we start, we should create new Orchestration Job for each use case and then we can insert Matillion Variables and create Shared Job. Bash component has Timeout parameter. By default, it is 1000 seconds. For extract, we might increase this in order to wait while your biggest extract will refresh. As a result, this component will refresh Tableau Extract based on value for the variable. In addition, we should create Matillion Variable for our parameter. 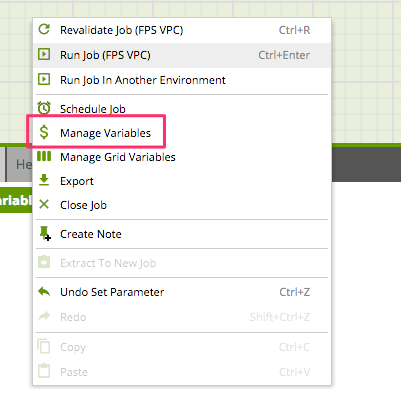 Click right button on canvas and choose “Manage Variables”. This script will export Tableau View into /tmp location on our EC2 and the then will upload to the Reporting Bucket via AWS CLI. Moreover, it will automatically create a folder in Bucket with the date. In addition, we specify the file name according to our naming convention. You might see how this solution is flexible and you can achieve much different use cases. As a result, with created new custom components that looks very friendly and familiar for the end users. Using this approach we can leverage any Tabcmd command and create a custom component for it. 2. Use SQS component. In order to trigger a dedicated job in Matillion that will trigger Tabcmd. In this article, we learned about the importance of integration BI and ELT/ETL as well as learn how to deploy Tabcmd on Amazon EC2 instance with Matillion. Finally, we used Shared Jobs and created Custom Matillion components in order to allow end users easily work with Matillion and Tableau. From connection through collaboration, Tableau is the most powerful, secure, and flexible end-to-end analytics platform for your data. Elevate people with the power of data. Designed for the individual, but scaled for the enterprise, Tableau is the only business intelligence platform that turns your data into insights that drive action. Want to learn more about Matillion and Tableau? Check out “Tableau 2019.X Cookbook”! In this book, fine a chapter on Matillion to learn the importance of data transformation in your analytics solution and see examples of how to integrate with Tableau Server.